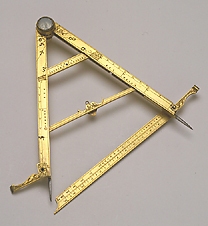 This folding rule, the work of the instrument maker Hans Christoph Schissler jr, was designed to perform military operations, including the measurement of the calibre of stone or lead projectiles, time-measurement and territorial surveys. For this purpose it is equipped with a scale of weights for cannon balls, a scale of measurement in Roman feet, a small compass in the hinge between the two arms, a visor at the end of one of the arms and a cross-arm with a scale of the daytime hours. A second cross-arm and a bob (now missing) allowed the instrument to be used as a plumb-rule for levelling and regulating the elevation of cannon. The instrument belonged to the donation brought by Prince Mattias de' Medici from Germany in 1635.